Champagne is the most romantic of wines but what is it that makes a truly great champagne or for that matter a great sparkling wine from Australia and elsewhere ( only sparking wine produced in the Champagne region of northern France can bear the name champagne ). Always with wine making it begins with the fruit, and in the case of champagne what we want is finest quality cool-climate Pinot noir, Pinot Meniere and Chardonnay grapes. Still it is not simply good fruit and competent wine-making that makes a great champagne. The secret lies in the yeast, in fact dead yeast. Champagne is made by fermenting crushed Chardonnay, Pinot noir and Pinot Meniere grapes in what is called the primary fermentation, after which the wine is placed in bottles with some added sugar to undergo a secondary fermentation that produces all of those lovely bubbles. The other by-product of this second fermentation is a sediment referred to as the 'Lees', made up mainly of dead yeast cells. In lesser quality champagne the lees are removed ( once a satisfactory quality of bubble is achieved ) through a cunning process involving keeping the bottles partly inverted and regularly and carefully turning them ( referred to as riddling ), so that the lees gradually accumulate in the neck of the bottle. The end of the neck is then cooled so it freezes and when the temporary metal stopper is removed from the bottle the icy plug of frozen sediment is ejected. Then the familiar popping cork is inserted et voila, champagne! In fine champagne however, the lees are not removed but rather stay with the wine to do their magic. A minimum of 18 months is required for the yeast cells to break down and release their amino acids and other complex components into the wine and slowly transform its character. 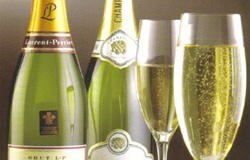 In some of the finest champagnes this "Lees Ageing" can last for 5 years or more. This extra contact with the lees does all sorts of wonderful things to the champagne, adding to it complex biscuity aromas, a more delicate, savoury flavour as well as giving it fine, persistent bubbles. Next time you enjoy a meal of light flavoured fish such as butter fish, blue eye or monk fish, rather than reaching for a Sauvignon Blanc try a lovely fresh champagne preferably one that has been blessed by extended lees ageing.